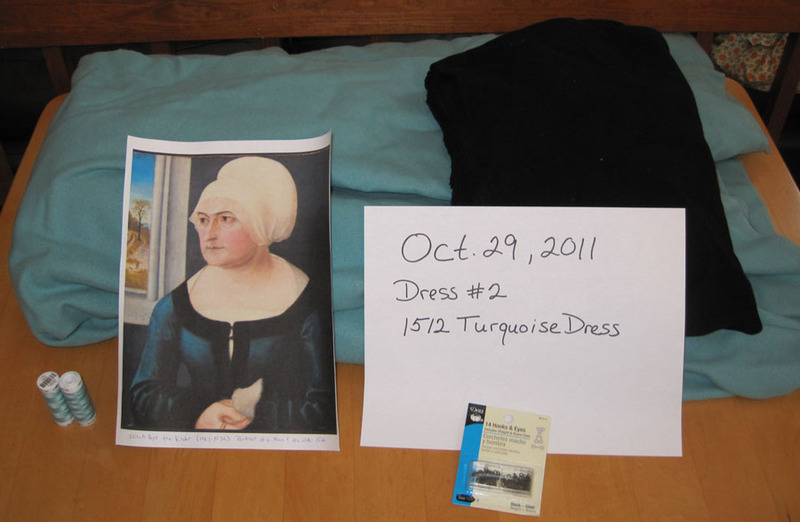 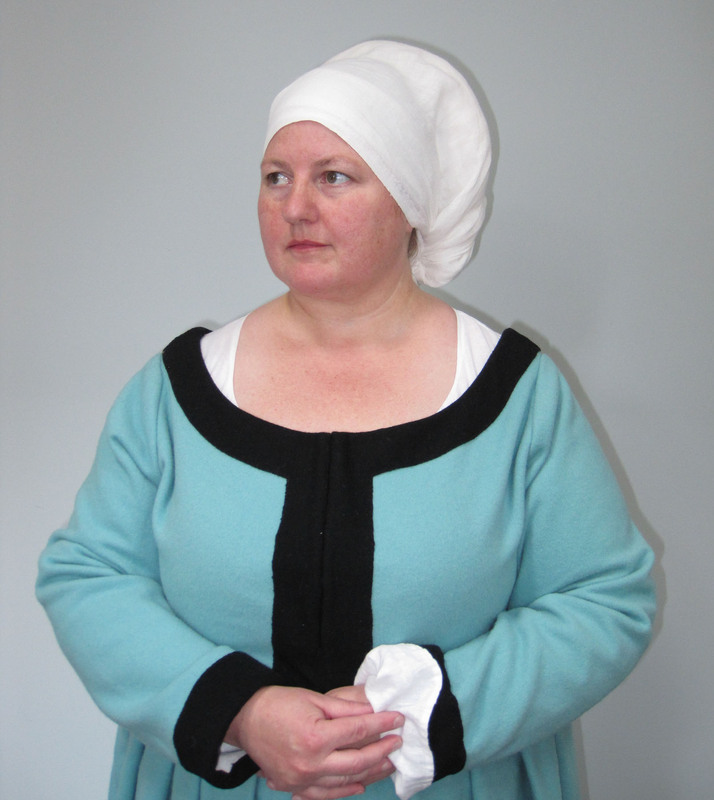 The 1512 Turquoise dress is the second dress in the series. 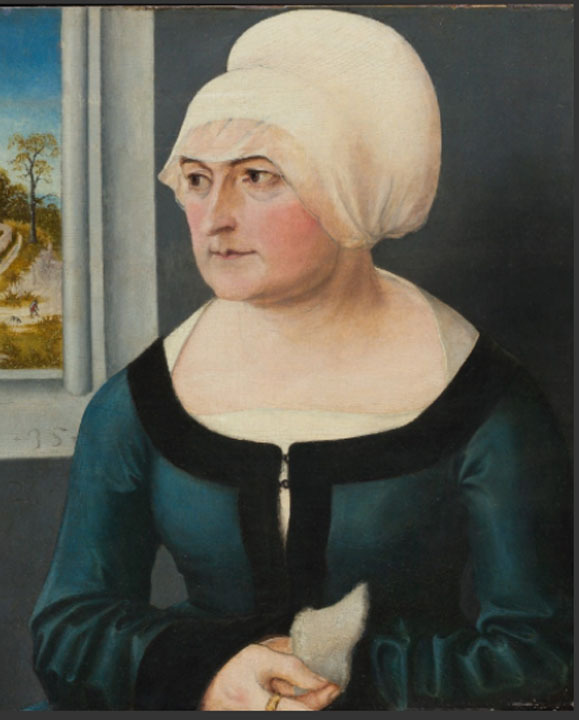 I have based it on the “Portrait of a Man and His Wife” by Ulrich Apt the Elder. 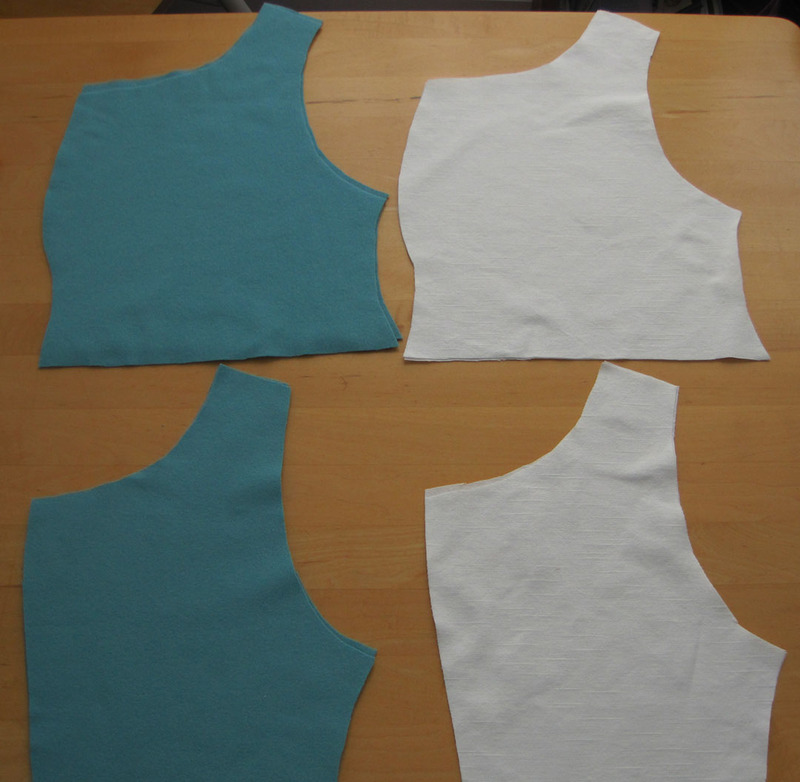 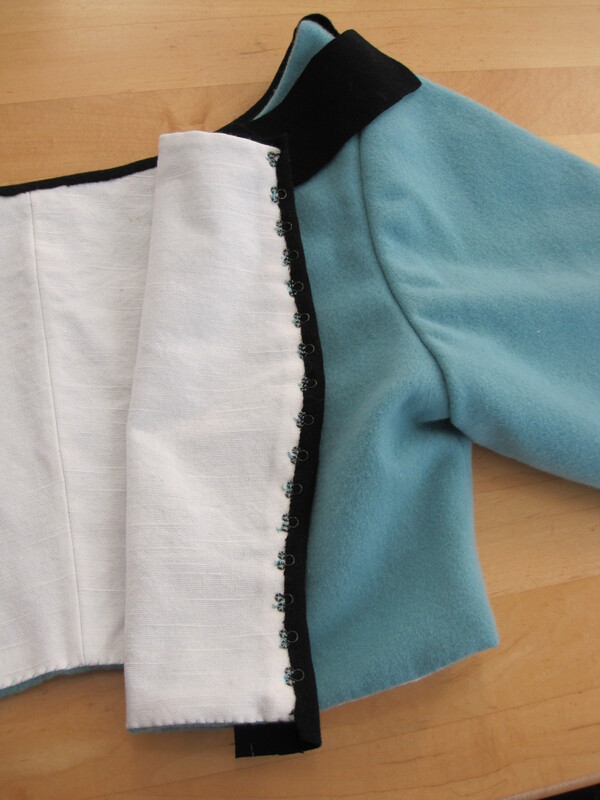 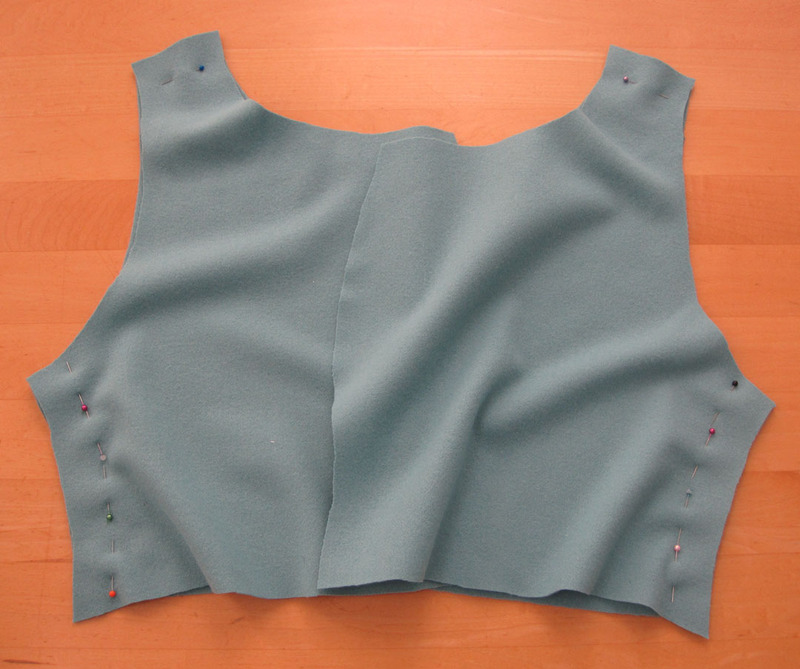 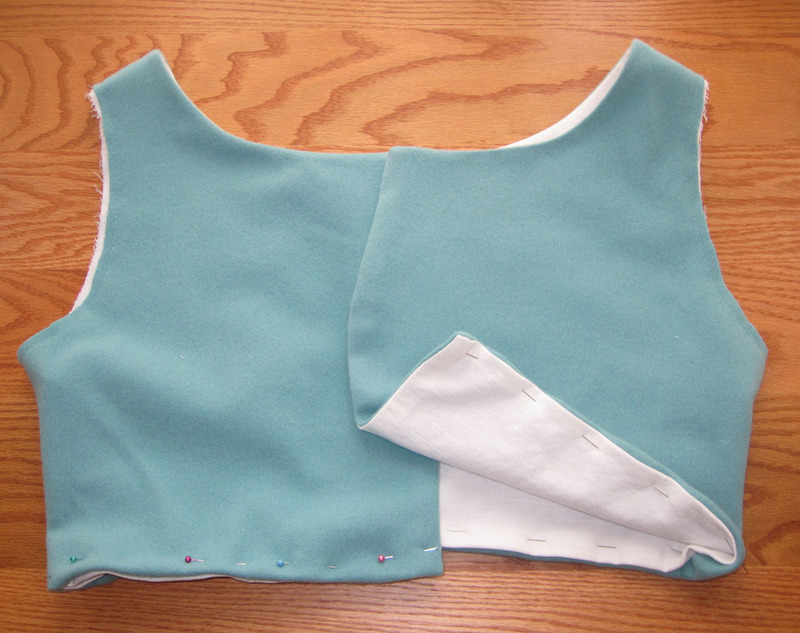 I created a new bodice pattern with a rounded neckline based on the bodice pattern used for dress #1. 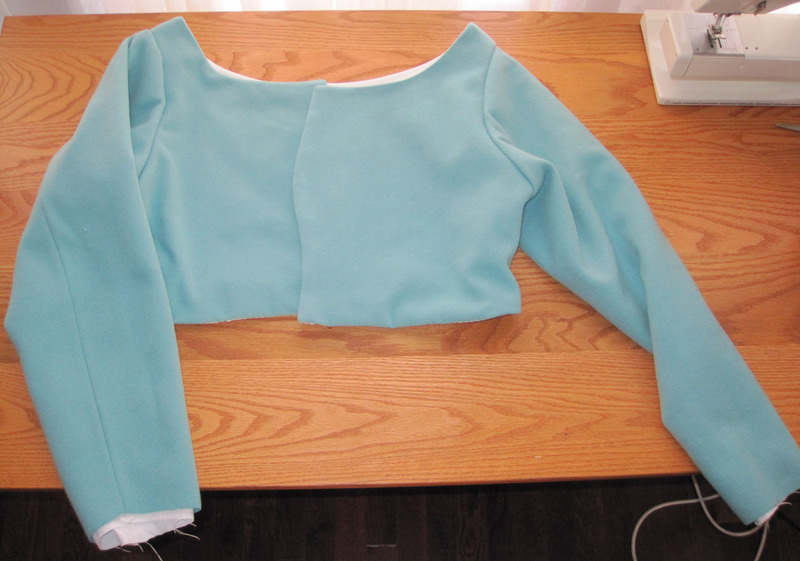 I used the same sleeve pattern and the same skirt configuration. 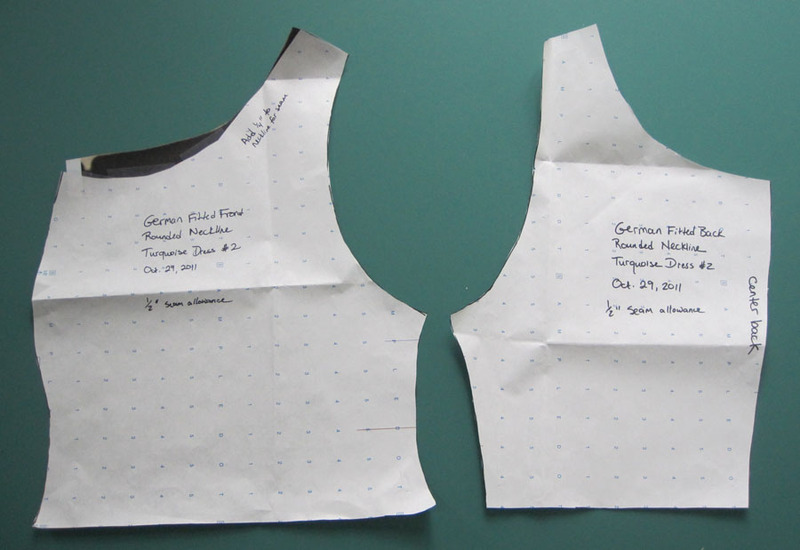 I had quite a time determining the correct neckline of the bodice. 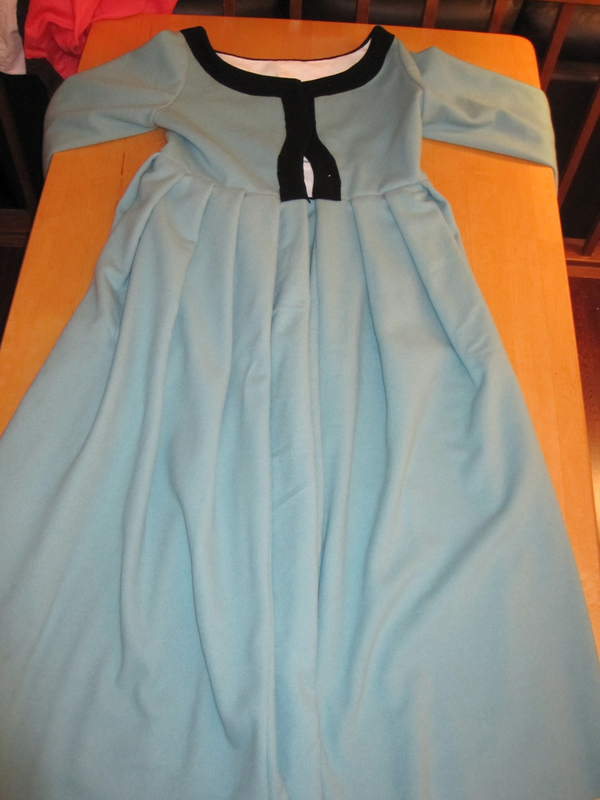 In the first photo, you can see that I created a pattern based on the square-cornered neckline of the dress #1. 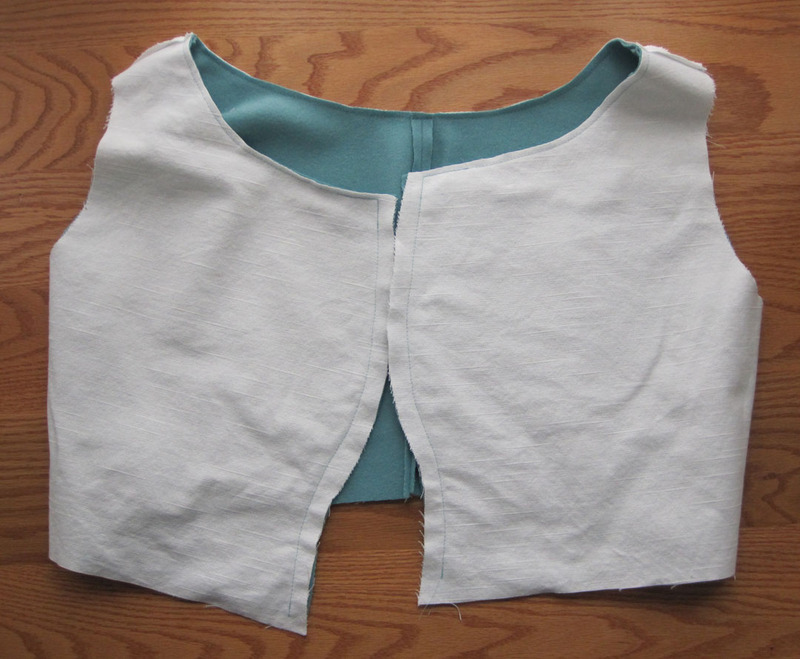 When I sewed the toile and tried it on for fit, the neckline still looked too squarish (even my husband could tell, so I knew it had to look wrong). 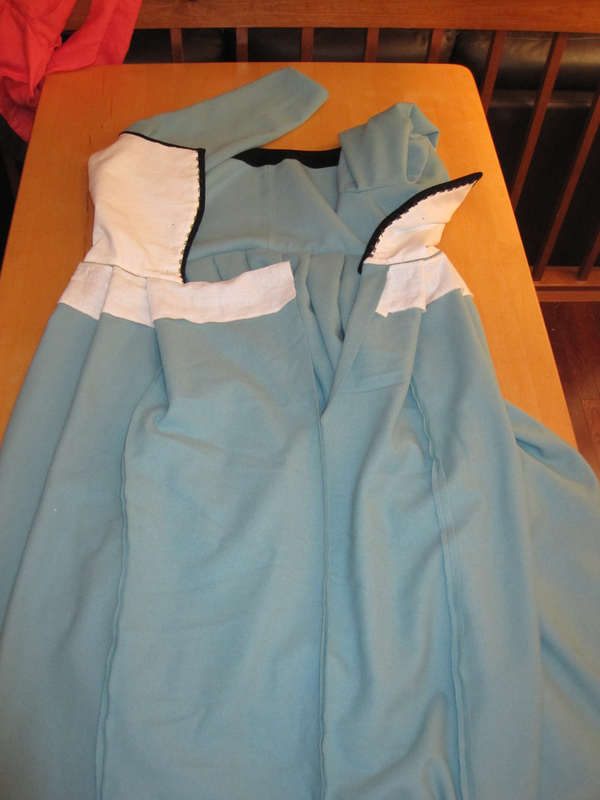 I cut the neckline an inch lower but it still looked wrong. 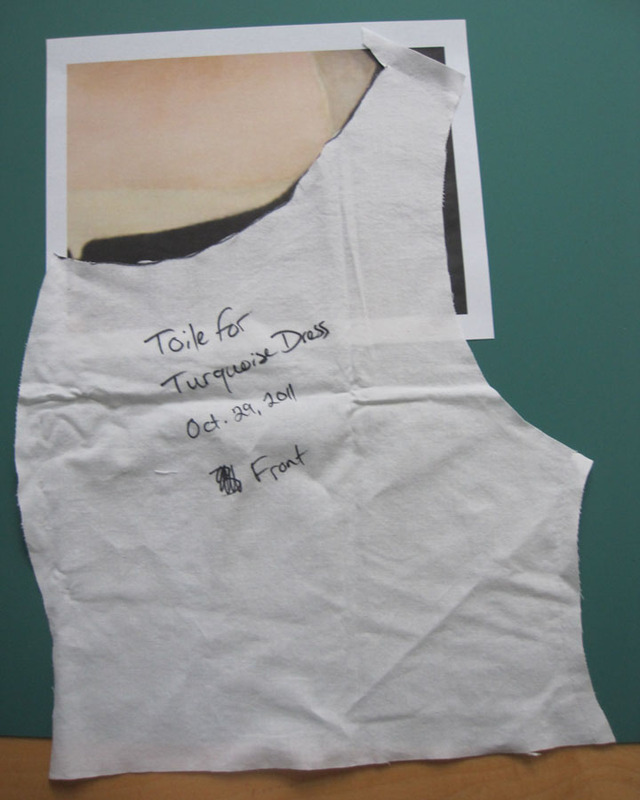 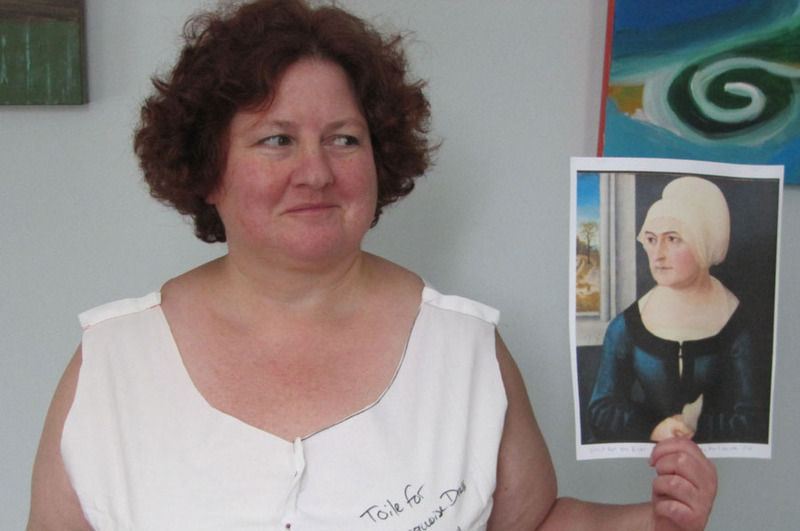 Undeterred, I used my trick of printing a copy of the actual painting and using the scaled up neckline, which I compared to the toile neckline. 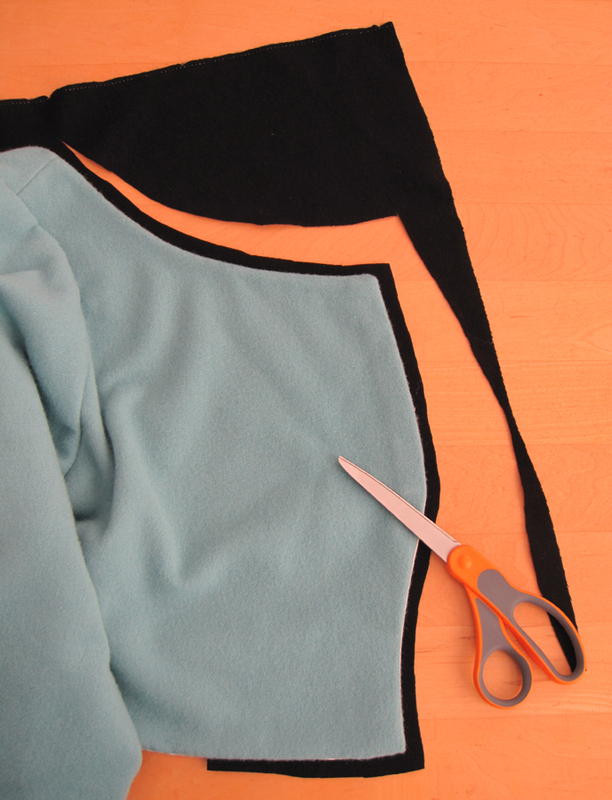 After making the adjustment, I cut the fabric. 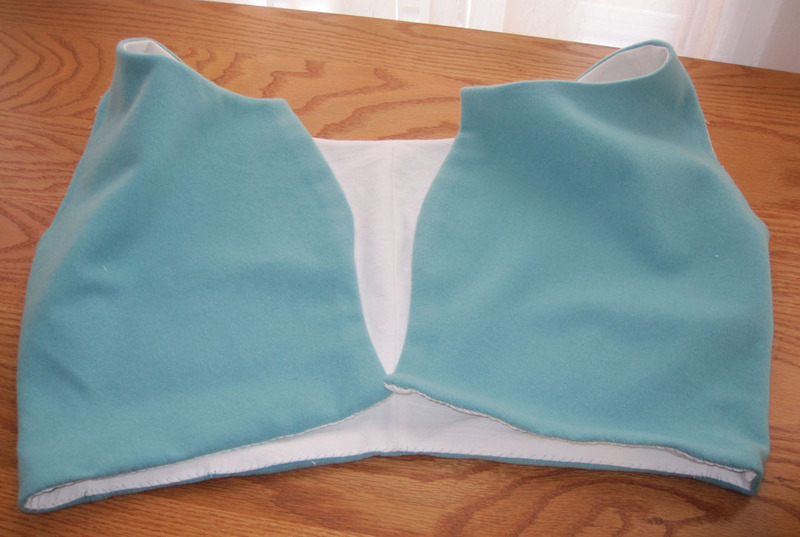 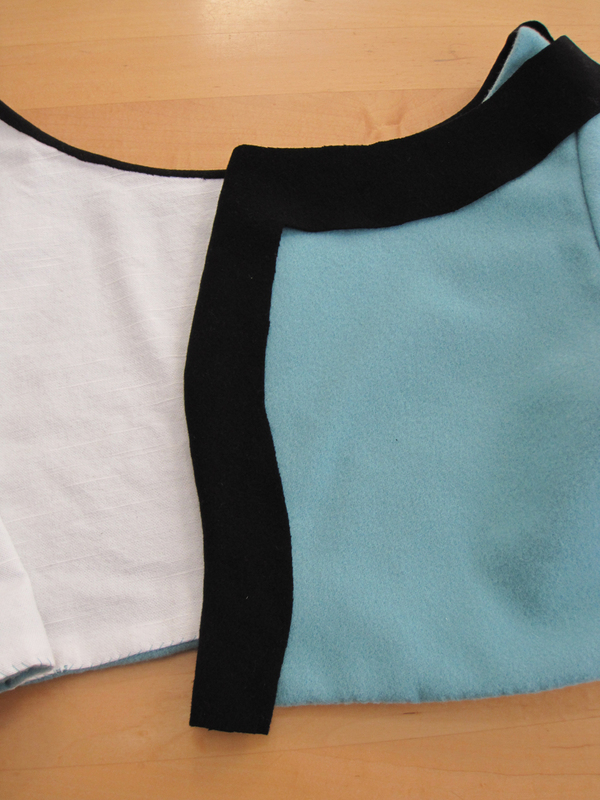 Sew guards to inside of bodice first. 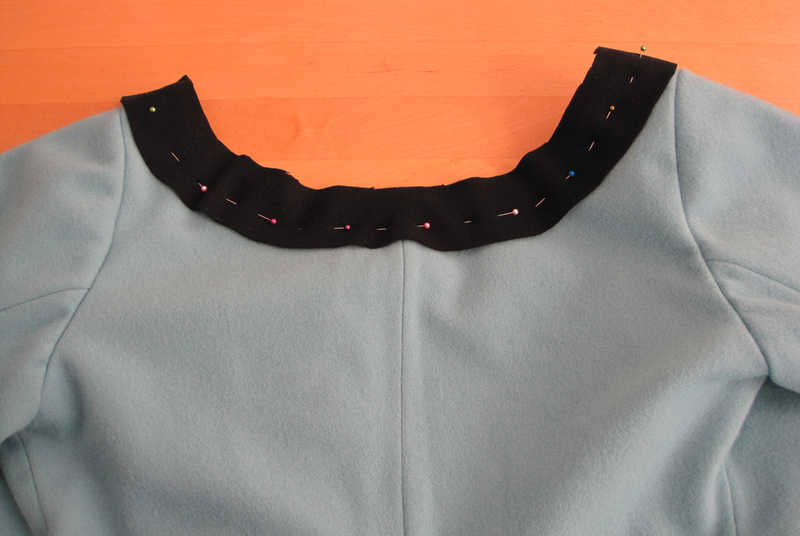 Then sew in the hooks. 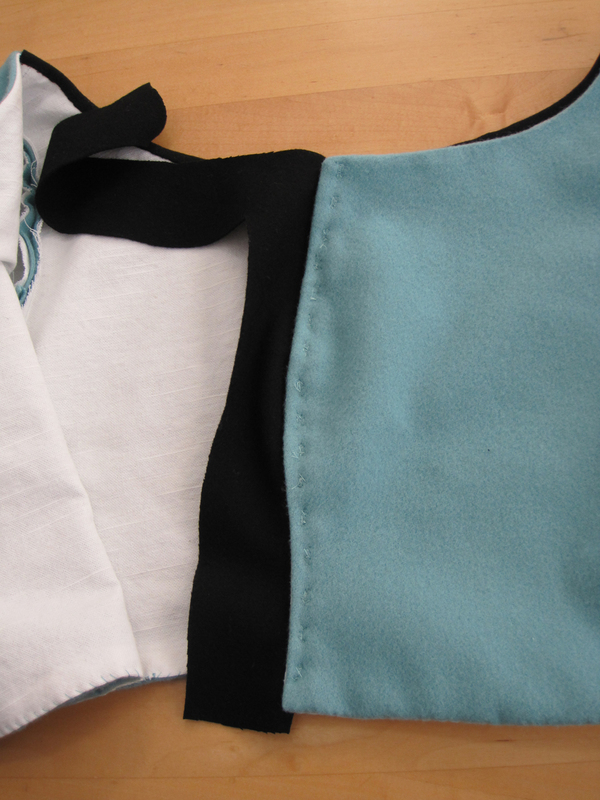 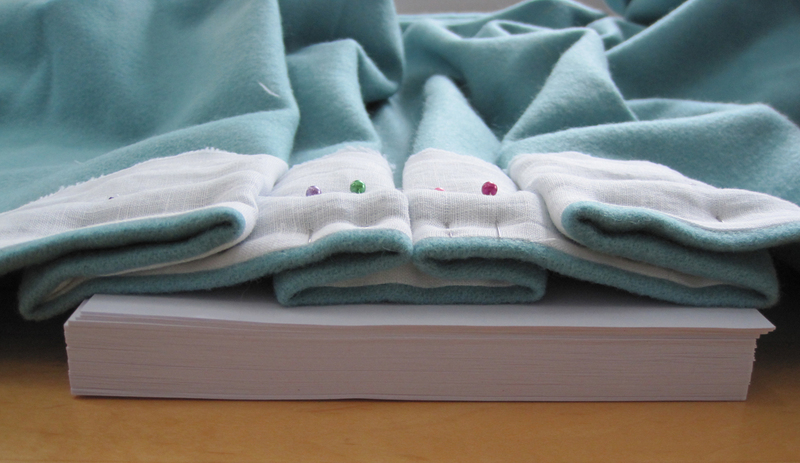 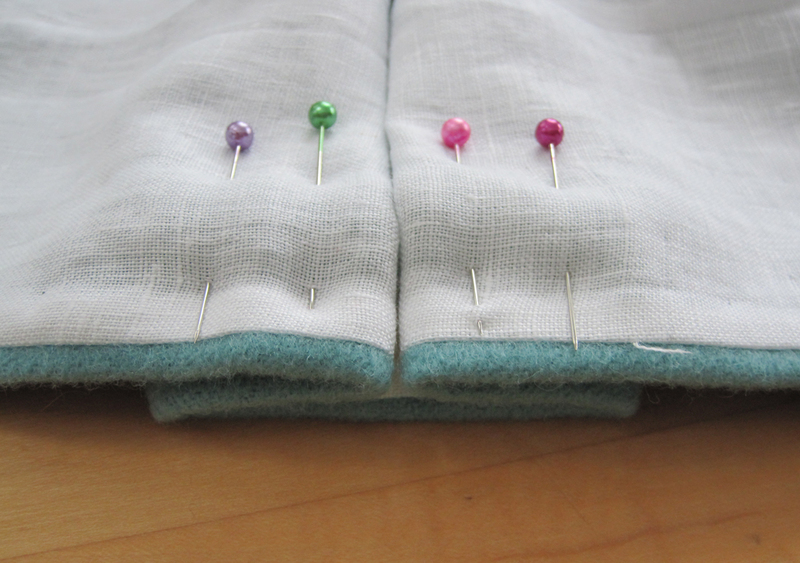 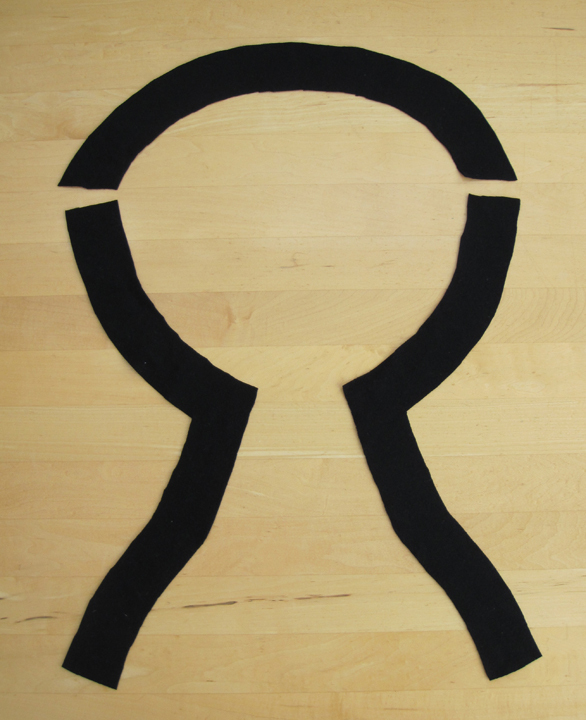 After you sew the hooks & eyes on, flip the guards over to cover them and sew the guards down. 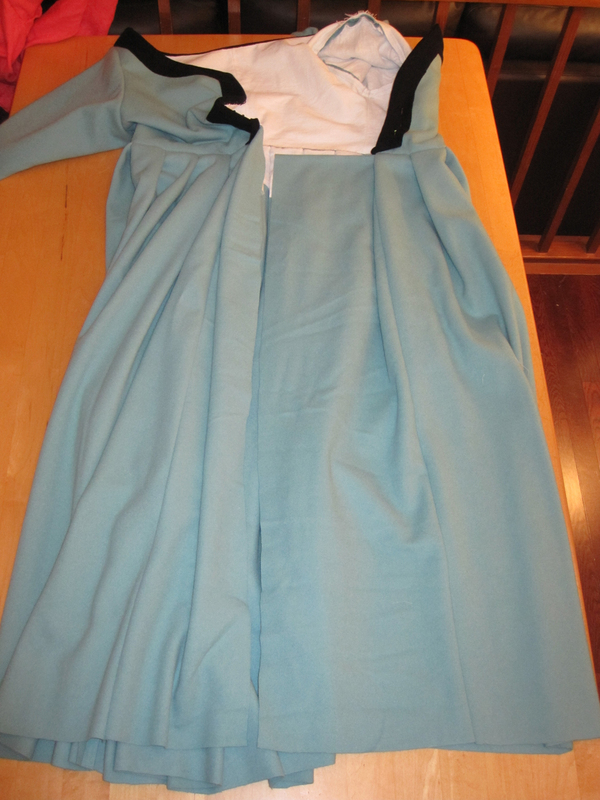 Bodice & skirt attached. 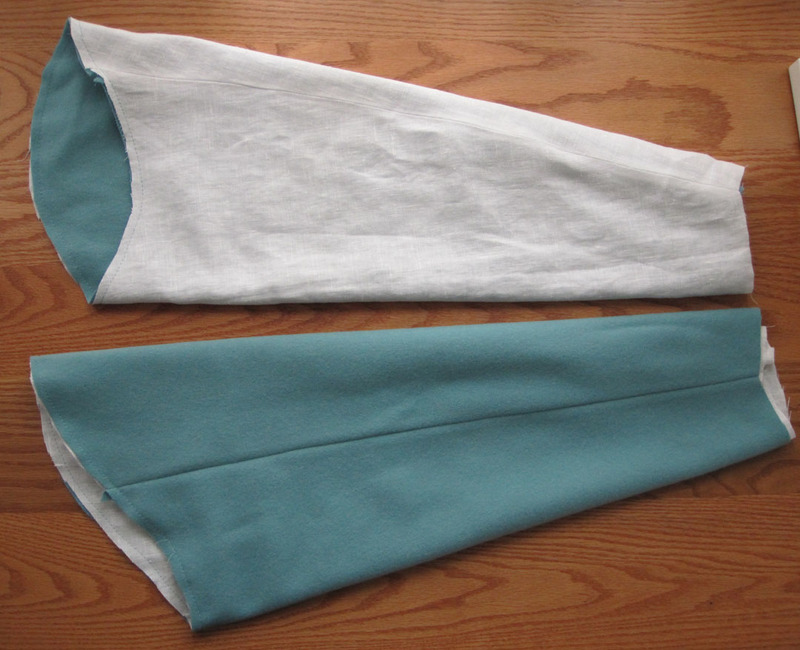 Fold on left, extension on right. 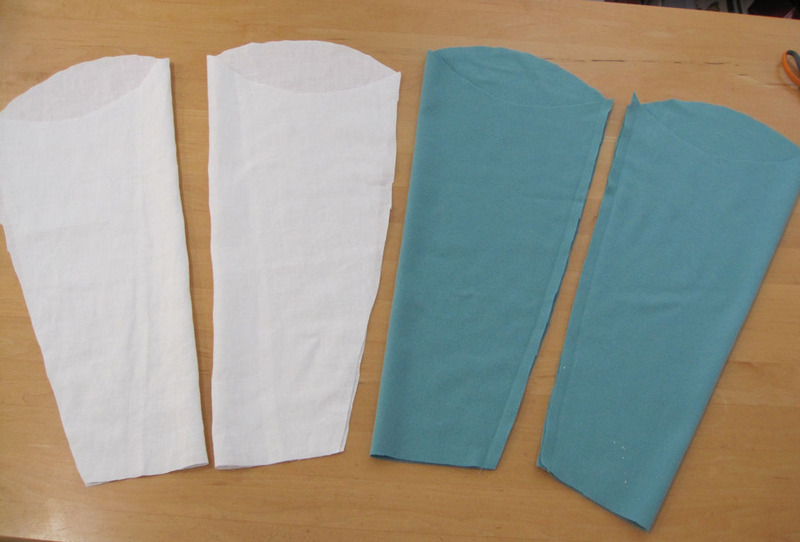 These will be sewn together to close the skirt front. 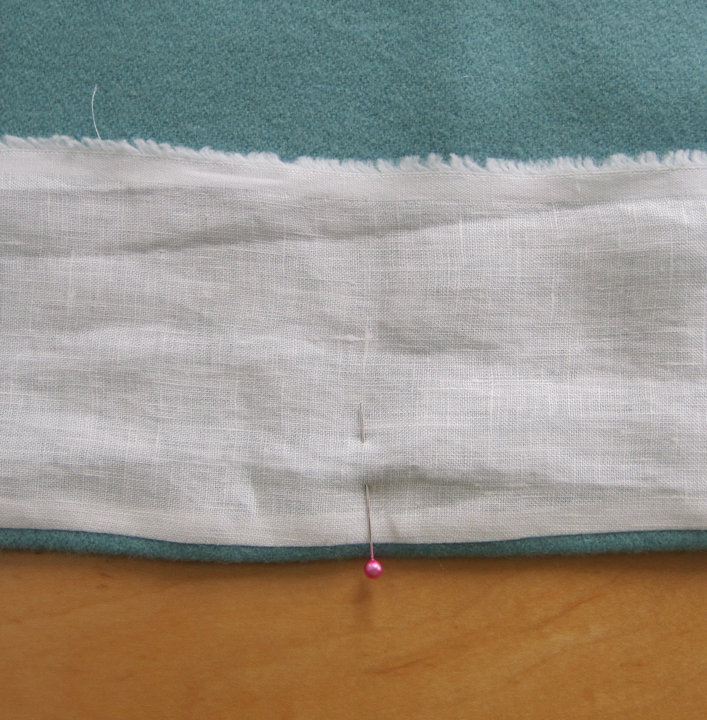 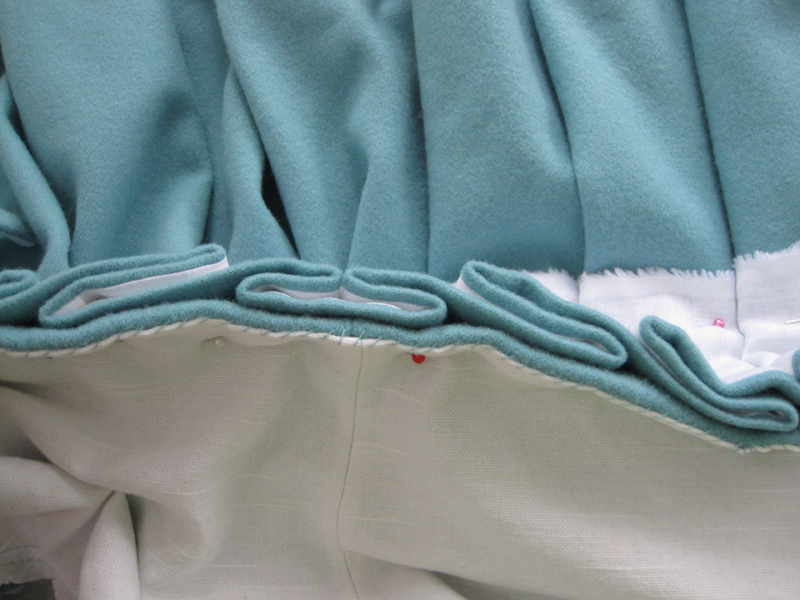 This shows the skirt fronts edge to edge before sewing. 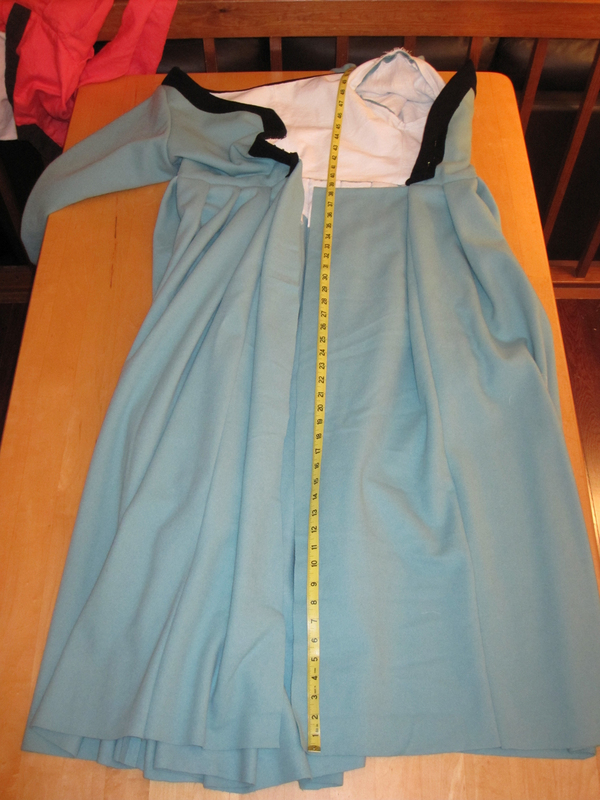 The tape measure is a visual aid in the midst of all that turquoise. 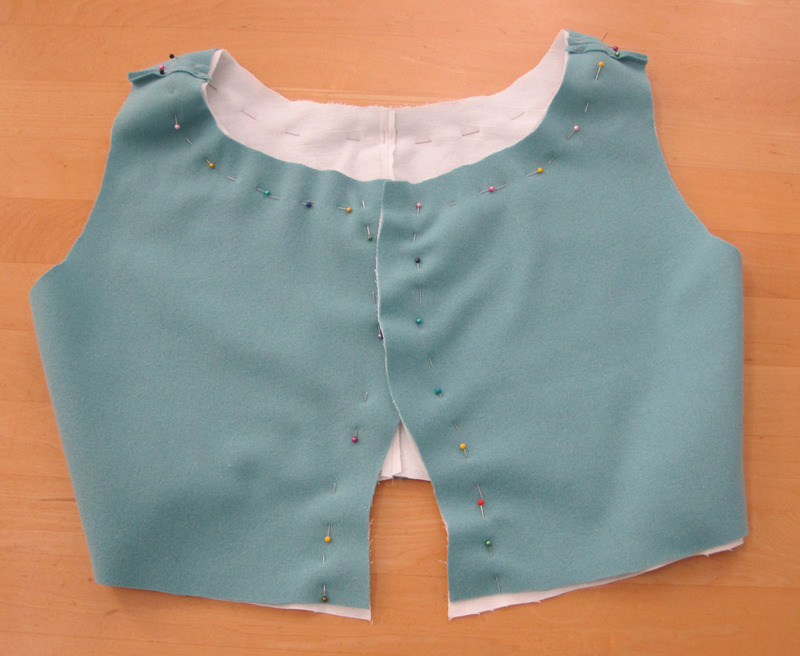 Skirt fronts pinned together right side to right side. 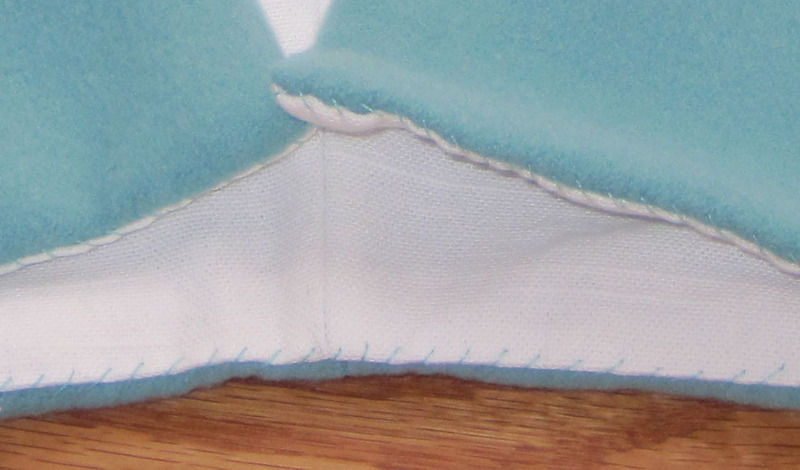 A 10″ gap is left open at the top to let me get in and out of the dress. 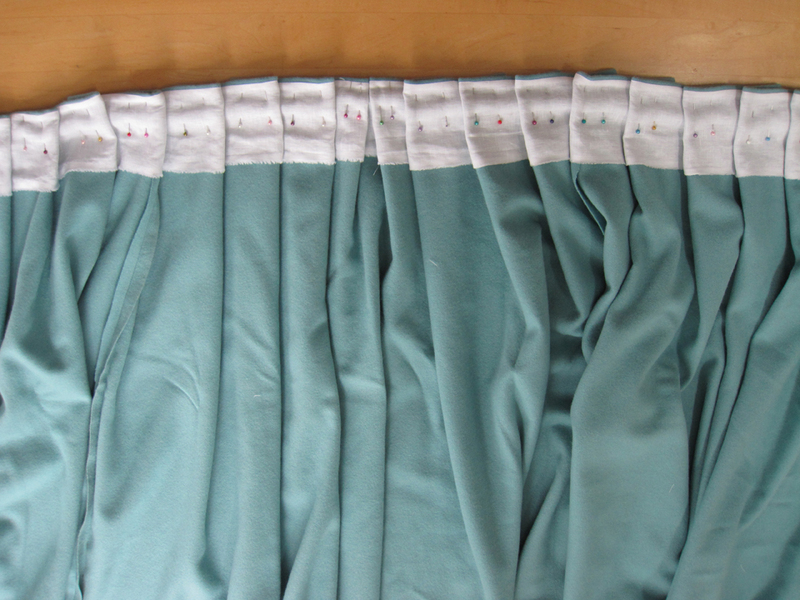 Skirt sewn together from the inside. 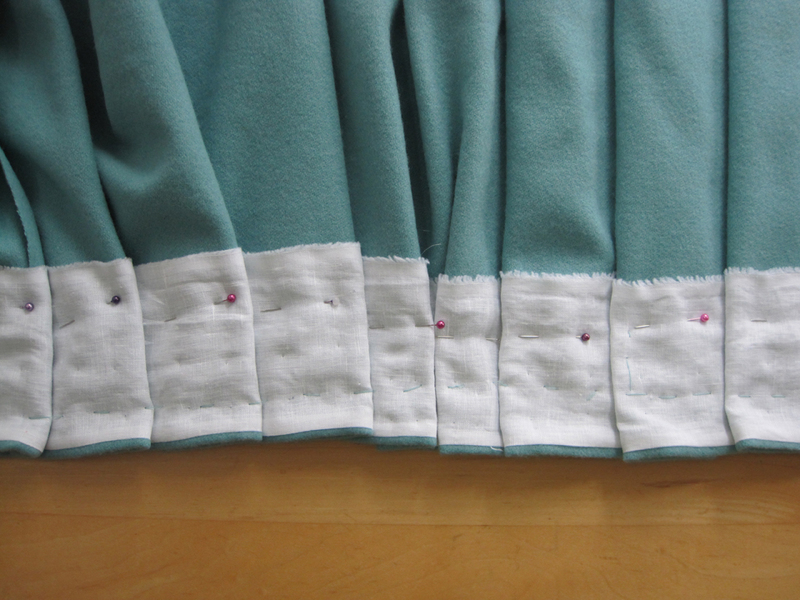 Skirt sewn together from the outside. 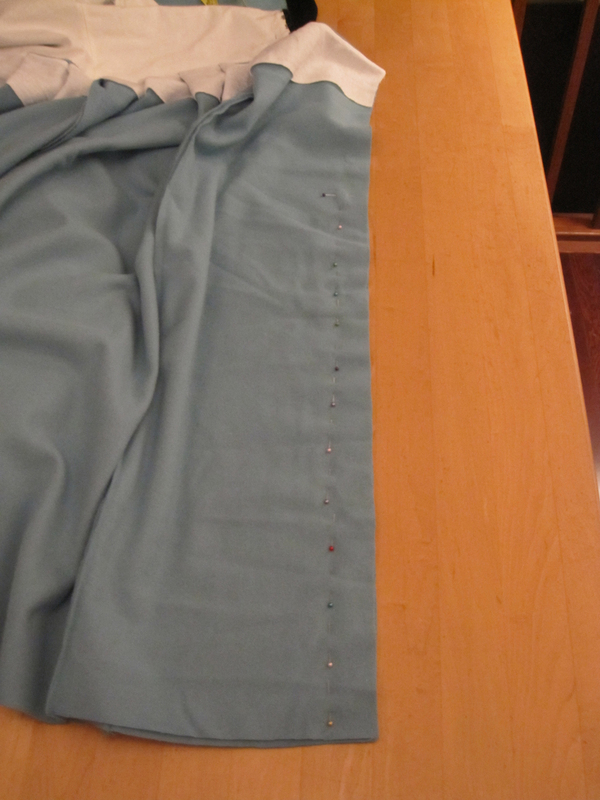 The extension is showing. 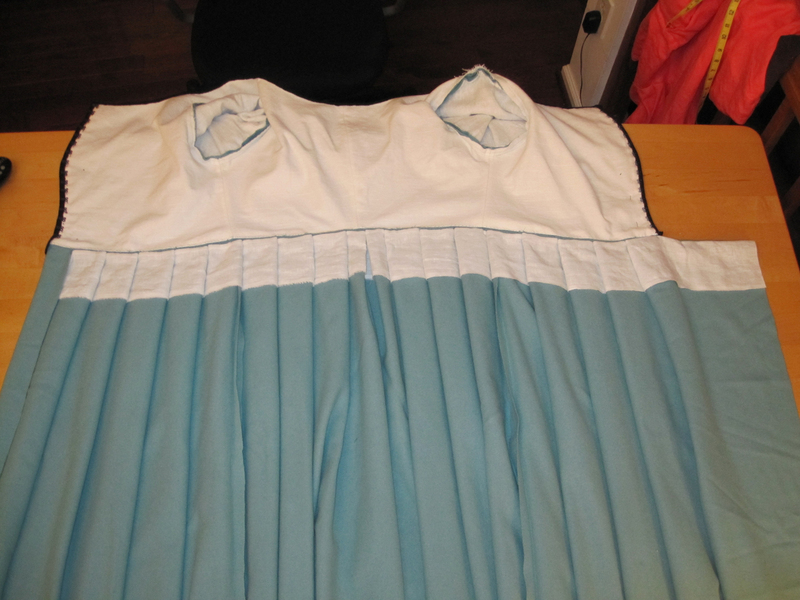 Dress shown with skirt closed.